Getting your floor clean after a storm when is full of dirt and mud can be exhausting especially if you are an elderly person. After trying to clean with things she had around the house, she realized she needed help. We arrived and make the disaster "Like it never even happened." During the Winter Storm Stella reports of more than a foot of snow in parts of Long Island. In this case the roof of the house had minor damage that with all the snow that accumulated ended up collapsing. 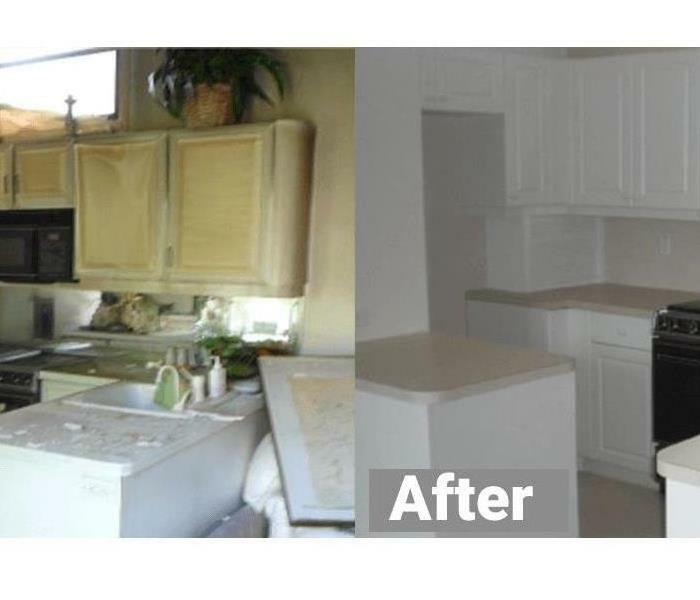 We clean, dry and restore furniture and items after a storm event. The most common cause of edge-warping or buckling in a laminated flooring is water or dampness rising from the subfloor in conjunction with the lack of a sufficient moisture barrier. In this image water penetrated the floor affecting the pad. 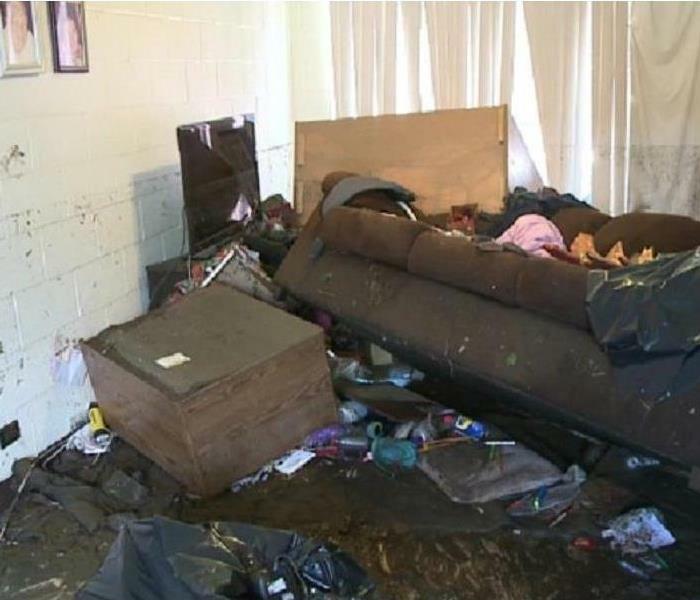 The sooner we start cleaning up water damage the sooner you can stop mold from growing under your carpet. 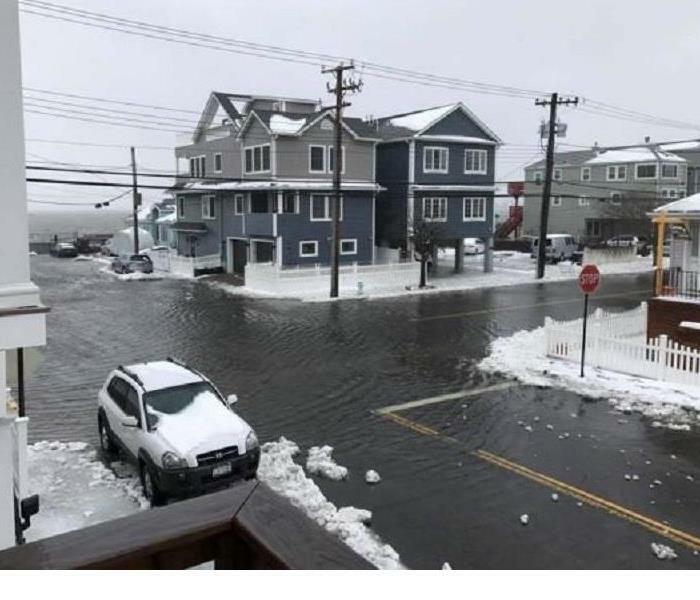 While the snow may not have been nearly as much as predicted, the winter storm that hit Long Island delivered on its promise of coastal flooding in Long Beach. The City by the Sea saw streets flooding with water as the storm turned from snow to rain. Several streets across the city were underwater, and residents were advised to stay off the roads wherever possible. Heavy rains flooded the coastal areas of Long island. Rain and hurricane force winds were felt at the eastern end of Long Island. On the picture you can observe the marks on the wall that the flood left. Residents in vulnerable neighborhoods that did not took steps to protect their property ahead of this storm suffered severe damages. This is one of the worst things that could happen to anyone. You're ready to do a makeover to your kids room and as soon as you start removing the wallpaper you notice that there is mold. Remember that any mold is dangerous; some are more dangerous than others. Don't put your family's health at risk. Close the room or area and call (516) 742-1008 immediately. Don't wait if you have a water emergency in you home. In this example a customer waited too long to address her damp carpet problem. Mold was already growing and had to be treated. 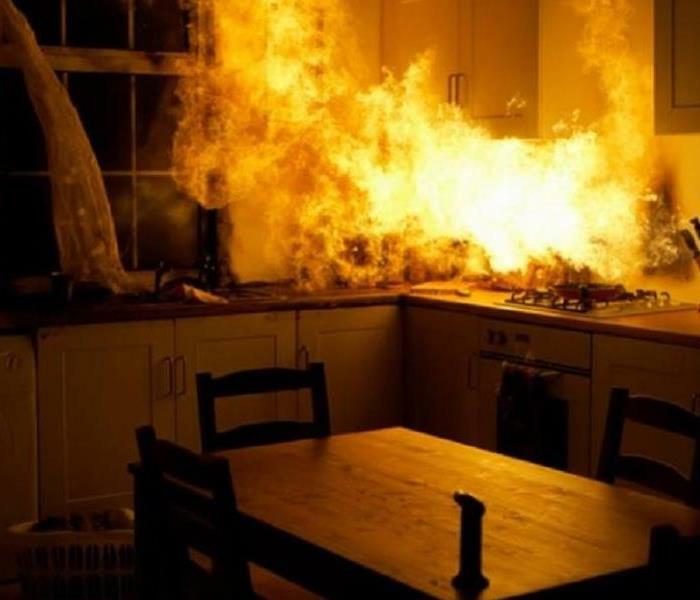 What happens in 2 minutes to 3 minutes after a kitchen fire starts? •The fire consumes kitchen cabinets, wood counter tops and shelves stocked with plastic storage containers and dry goods like cardboard boxes of cereal, crackers, and cookies. •More and more heat is generated. The temperature in the upper layer of hot gases rises to 400 degrees F—hot enough to kill people. •The heat concentrates is a very dense smoke cloud hovering just a few feet above the floor. It may also include more toxic components like arsenic (used as a wood preservative) and lead (from old paint), as well as irritants like ammonia. In case of emergency contact your local fire department and remember we are here to help. If grease catches fire, don’t try to move the pan or pot. Put a metal lid on top of the pan to shut off the oxygen supply to the fire. Our technicians specialize in restoring customers’ belongings that have damages related to water, mold, smoke, and fire. "A analytical HVAC evaluation reported that Staphylococcus aureus, among other pathogens are part of the indoor environment’s bacterial flora in HVAC systems"
Poor indoor air quality can cause illness requiring absence from staff, and can cause acute health symptoms that decrease their performance while at work. Pollutants are known to produce allergy-like symptoms, coughing, wheezing, watery eyes, asthma type conditions and other symptoms in building occupants. Well, S.aureus has long been recognized as one of the most important bacteria that cause disease in humans. It is the leading cause of skin and soft tissue infections. 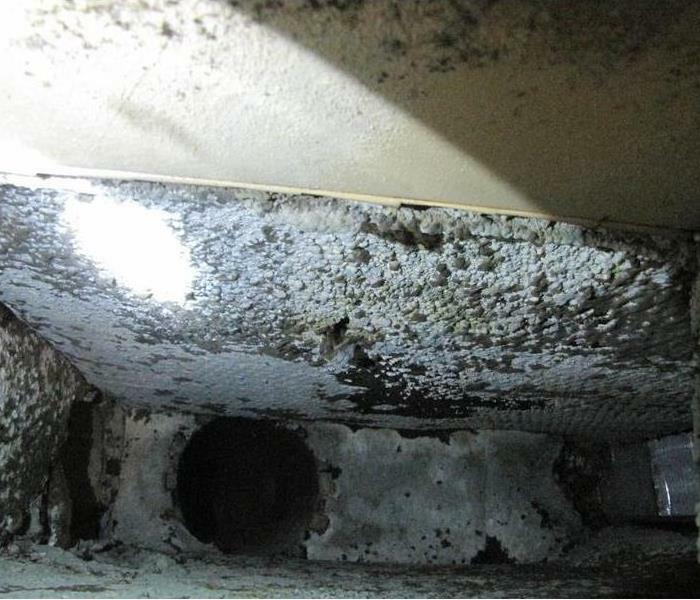 Leaving MOLD SPORES in indoor environments, especially in the HVAC system, might end up complicating indoor air quality. SERVPRO of New Hyde Park / Mineola professionals routinely inspect the heating, ventilation and air conditioning unit (HVAC). Keeping them clean can extend the life of the equipment. This can in turn save you money and give you cleaner air to breath. The aftermath of smoke and soot lingering throughout this property could've caused even more damage and health related threats if they have waited on decided to clean themselves. All of then that were present at the time of the fire contain the smell and evidence of these hazardous vapors. Human exposure routes to soot include: Inhalation, skin or eyes and ingestion. This business in New Hyde Park called us immediately after they notice water damaging walls. 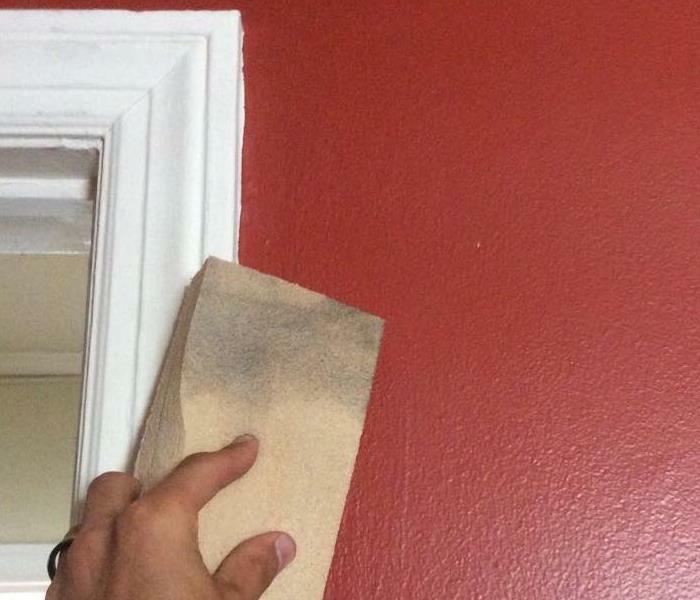 It was extremely important to dry out the walls as quickly as possible. These powerful fans use efficient, yet powerful, motors to create high-velocity airflow that dries water-damaged areas quickly. During operation, an air mover rapidly moves the air around in a space, which heightens the rate of moisture evaporation. After a pipe burst in this bathroom, it was extremely important to dry out the area as quickly as possible. Prompt drying will not only ensure that this business bathroom could be used promptly, but also reduce the risk of structural damage and inhibit the growth of harmful mold. A line from a refrigerator on this lunch room broke leading water flooding the room and part of the hall during the night. 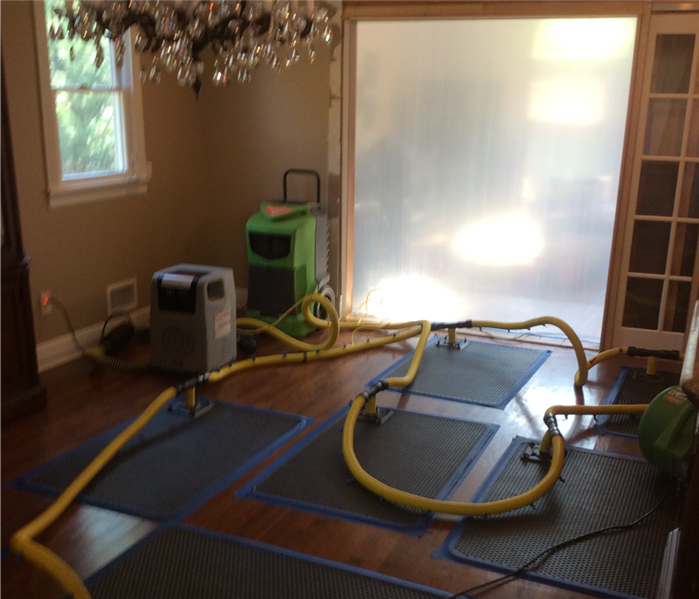 We installed an air mover and dehumidifier to finish the repair. High-speed air movers create airflow across walls, carpets, pads, and furniture, which accelerates the evaporation of moisture. Commercial water emergency with rapid response. 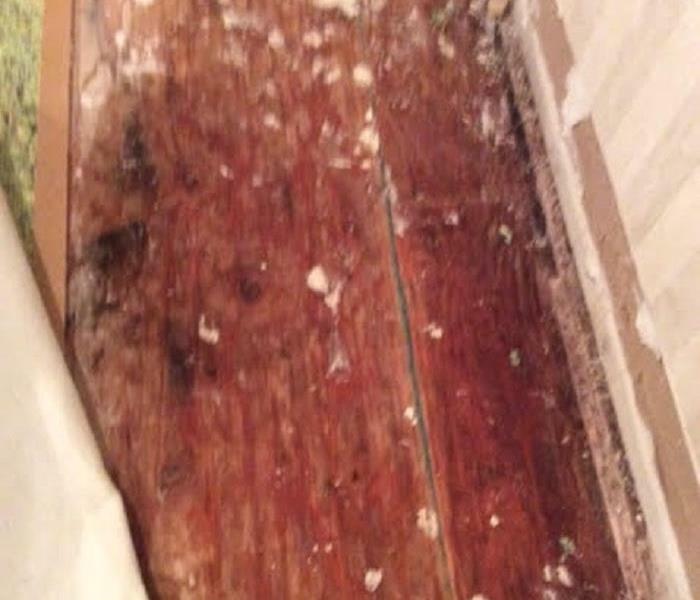 after returning from vacations, this family discovered that the basement was covered in mold. 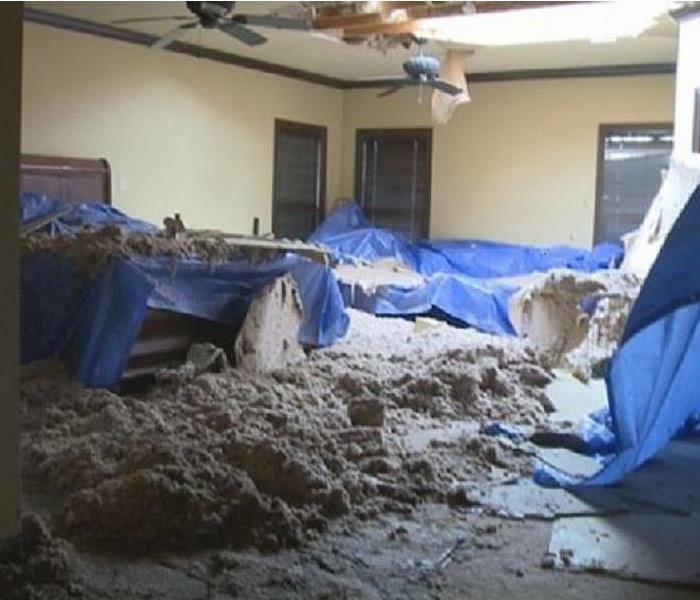 The property had a leak that was unattended during their vacation. Mold was present on basement walls, roof and floor. Water pipe broke at this commercial establishment and as any business it needs to keep operating. Client closed the source of water. Mat were removed exposing water damage to the wood. 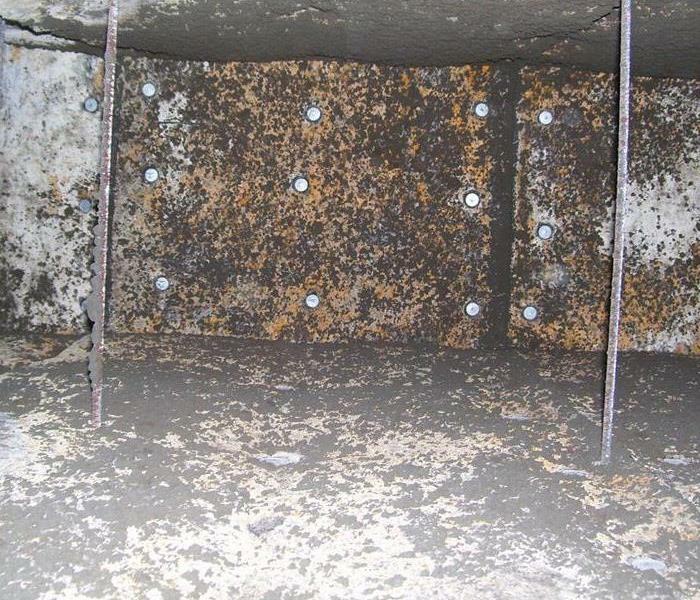 We use chemical dry sponges to help the mitigating process of any loss by determining what can be repaired instead of replaced. On a lot of surfaces we try to avoid wet cleaning which often leads to smearing, smuding or staining and can actually do more damage on certain surfaces than the fire did. These thick, porous dry cleaning chemical sponges are used primarily in smoke and soot removal in fire damage jobs. One way to make the carpet drying process go faster is by using a weighted extraction system. In this picture our water removal technician is essentially walking throughout the wet area and pressing down into the carpet, where the extraction tool then begins sucking up any water through the vacuum it is attached to, including any water soaked into the carpet’s padding or underlay. Moisture meters are a very helpful tool for detecting the presence of moisture in building materials, and for helping to pinpoint the source of that moisture intrusion, even when the origin point may be out of sight. 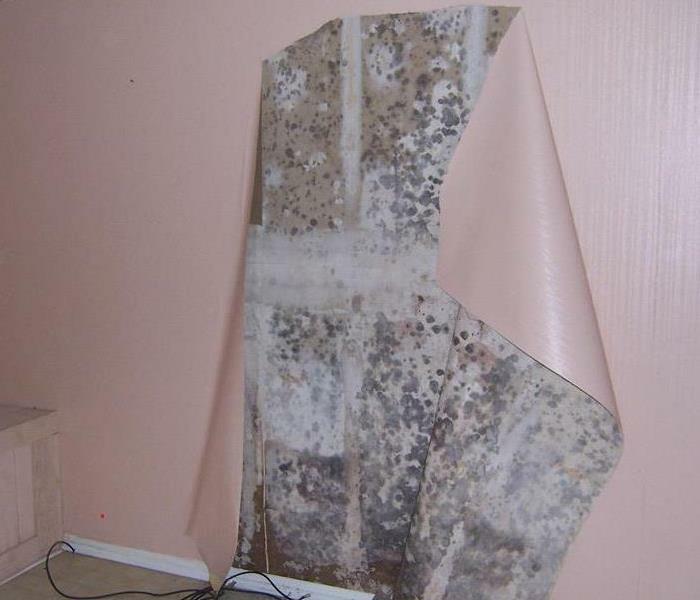 This one is showing that the wall has 99.9 % of humidity, meaning that there is water damage in this specific area. 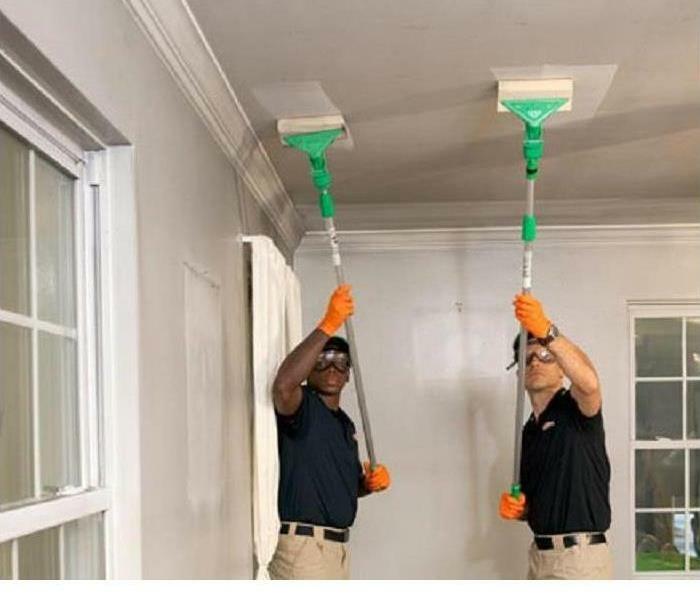 SERVPRO of New Hyde Park/Mineola was called to a water damage in a Mineola home. 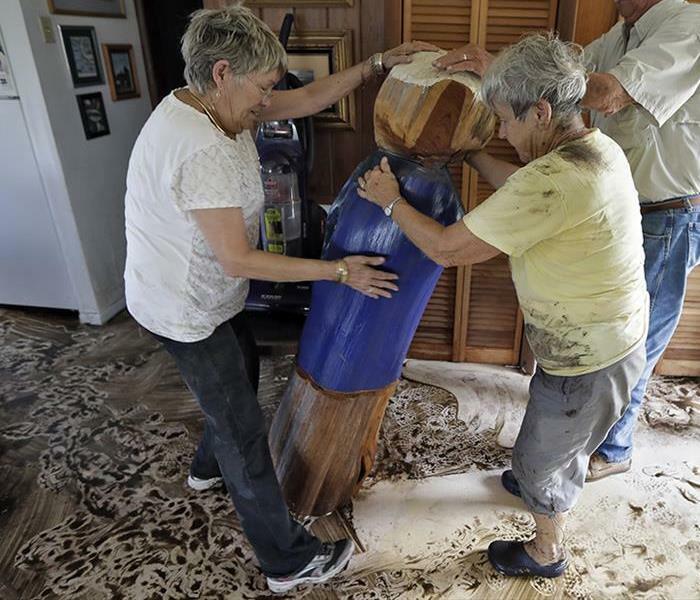 The water damaged the homeowners wood floor. SERVPRO of New Hyde Park/Mineola was able to save that floor from being ripped out by using our floor drying system.